The Burj Al Arab is a hotel that breaks all barriers. Literally meaning “Tower of the Arabs”, this Dubai 7 star hotel holds a proud position in the Emirate's skyline and of course their hearts. It is 321 meters tall, making it the fourth tallest hotel in the world. The hotel is built on an artificial island and is 280 meters out from the Jumeirah beach. The world's only 7 star luxury hotel stands out magnificently in Dubai's skyline, giving tourists and residents of the country an impression that it rose up from the water of the Gulf. The hotel aimed to create an essence of the Middle Eastern region and serve it on a gold platter encrusted with every precious stone imaginable. 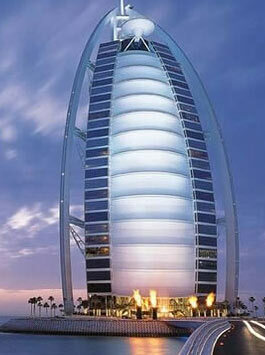 The Burj Al Arab was built to create a landmark equivalent to the Sydney Opera House or the Eiffel Tower in Paris. In other words, the shape of the hotel was to be synonymous with Dubai city. The Dubai 7 star hotel was built to resemble the sail of a dhow – an Arabian boat. The visionary behind this architectural brainwave was Tom Wright. He and his firm promptly delivered the idea to the resort company – Jumeirah International. The construction of the hotel began in 1994. But first an artificial island was built and this feat took two years. The hotel was built in less than two years. The hotel's atrium takes up one third of the overall space and rises 590 feet above the lobby. A series of pillars hold an immense position in the atrium. The pillars and their criss-crossing spandrels are gilded with 22 karat gold. The Dubai 7-star hotel has used 24000 square meters of 30 different types of marble and if that's not all the Royal Suite has leopard print, gold and marble drape an area of 780 square meters. Al Muntaha is the highest restaurant in the hotel and it is situated 200 m above the Persian Gulf while the Al Mahara is an under-sea restaurant. Burj Al Arab obtained granite from Brazil, marble and glass from Italy, while the hotel's linen was shipped from Ireland. It might look like excess, but then the Jumeirah Group did not want to compromise on quality. Price was not at all a factor. Marble staircases, a fake submarine ride to the underwater restaurant, rotating beds, private cinemas, individual mosques in every suite, changing rooms the size of a bedroom et al are just a few examples of the extent to which the hotel goes to offer the best and nothing but the best to its privileged guests. Mere mortals cannot approach the hotel without a reservation in any of its 10 restaurants. But even that is unattainable for ordinary citizens. The bourgeoisie will have to be content with the hotel's profile on the city's skyline for, during the day it is a gleaming structure. At night it transforms into a magnificent picture of perfection. The scrim of the hotel serves as a projection screen for colorful light shows. All in all, Burj Al Arab is a lavish hotel which has combined the technology of the west and the grandeur of the east in the best possible manner.